An inviting home in Dallas makes the most of its wooded lot with an interior courtyard and plenty of windows. The home's outer walls were dry-stacked with limestone cut from a Texas Granbury quarry, and its gabled roof was made with weathered Cor-Ten steel that emits the same maverick spirit as a Richard Serra sculpture. The freestanding fireplace just inside the courtyard was even salvaged from the old house’s living room. Clean stucco walls contrast with the grass and trees, while reclaimed wood siding complement them. The entry courtyard provides a natural extension to the living room. Tiled in silver-speckled sandstone, its stacked steps echo the home’s minimalist, rectilinear design. The patio’s only furniture is a set of vintage lounge chairs. “These were chosen for their diaphanous appearance, because we didn't want anything obstructing the beautiful exterior views,” interior designer Joshua Rice says. For this project, the husband loved ultra-modern design, while the wife leaned towards a more traditional aesthetic. How to please both? “Through the design process, we learned that their tastes were actually more closely aligned when we focused on the desired 'feel' of the home versus specific design details,” Field says. He and his colleagues balanced rustic, exposed ceiling beams with elegant venetian plaster walls, and artful aluminum storefront windows with functional white oak plank flooring. Rice faced the same challenge of creating modern yet family-friendly interiors. He settled on a warm, muted palette with lots of texture. The space features a mix of comfortable seating with more unique, collectible pieces — like the Jean Prouvé daybed or Vincent van Duysen chairs by the window. "I wanted the space to feel like a home rather than a museum,” Rice says. The family room boasts a Monza Triennale Floor Lamp by Gino Sarfatti and a Long John Bench by Edward Wormley, both from the 1950s, as well as a pair of ‘60s rosewood and leather ‘925’ lounge chairs by Arfa and Tobia Scarpa. Pieces by Ludwig Mies van der Rohe and Alvar Aalto also fill the space. In the master bedroom, the textural appeal of the reclaimed wood wall, bedding, and rug contrasts with the black leather of the African-inspired ‘Bwana’ Chair by Finn Juhl, which sits beside a ‘TAB’ reading lamp by Barber Osgerby. “We believe a quality project is defined by the sum of all its parts versus any individual feature or design move,” Field says. Privacy was important to the family, but they also wanted large expanses of glass through which to enjoy the trees and pond. The solution was a clever C-shaped courtyard plan that shields the home's open interior. Sometimes you have to let go of a good idea in order to pursue a great one. 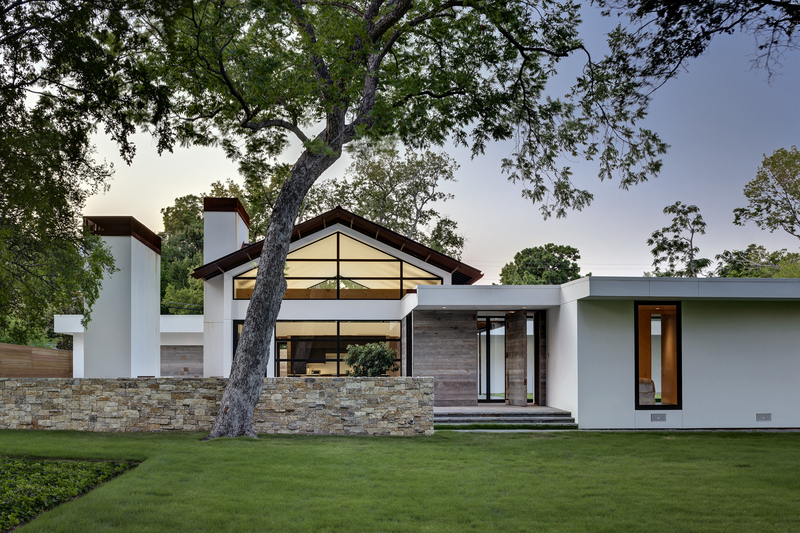 After several design studies for a remodel of a 1960s ranchburger-style home in Dallas, Texas, Braxton Werner and Paul Field of Wernerfield Architects convinced their clients to scrap the plan altogether. The original house was oddly situated on its one-acre wooded lot, and it didn’t engage well with a large pond at the back of the property. In its place, the architects proposed “a sprawling, single-story home tucking under the canopy of mature trees” near the water, Field explains. There would be less street noise, more privacy, and improved views—all in all, a better environment in which the husband and wife could raise their two young children. Their new 4,800-square-foot residence, built by David Gross Fine Homes, in the Preston Hollow neighborhood is warm and inviting, yet unapologetically modern.